Driveways, retaining walls, patios, front steps – if these are formed out of concrete, they will inevitably need to be repaired at some point. However, what if that “some point” occurs during the dead of winter? Concrete is a fickle material in extremely cold temperatures because of how quickly it dries and sets, and how easily it can crack before it has time to set. If you need to have concrete repair work done during winter, it is vital that you contact an expert source for the job. A common cause of concrete damage is due to a sinking or unstable foundation. Poor installation of the initial construction of a home, driveway, or retaining wall will not allow for the natural settling of the foundation and will lead to unnecessary damage. At Anglin’s Foundation & Masonry Repairs, we offer expert assistance in determining the cause of your concrete issues and repair options. Repairing concrete during winter is a tricky business, and it requires exact steps for it to be done correctly. Many times, if the concrete damage is not dire, a small fix can be done to save the concrete until warmer weather arrives. Here in Georgia, our temperatures are often warm enough for concrete work to be done during winter. However, inconsistent temperatures and cold February days can make it difficult to plan for concrete repair. At Anglin’s Foundation & Masonry Repairs, we have the expertise needed when it comes to concrete repair in winter. If your situation requires immediate attention, we will do what is needed to make the concern right. If your situation needs moderate attention now and serious attention later, we will do what is necessary to patch the area until a permanent solution can be made in warmer weather. 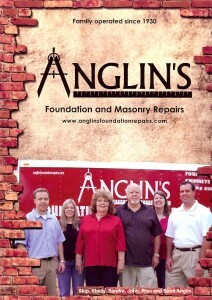 Anglin’s Foundation & Masonry Repairs is the name to trust for all your foundation and masonry repair needs. Every concrete repair case is different, and we have the expertise and experience to provide you with the solution that you need. We have been Atlanta’s trusted source for foundation, masonry, and concrete repair since 1930. Call today for a free estimate.